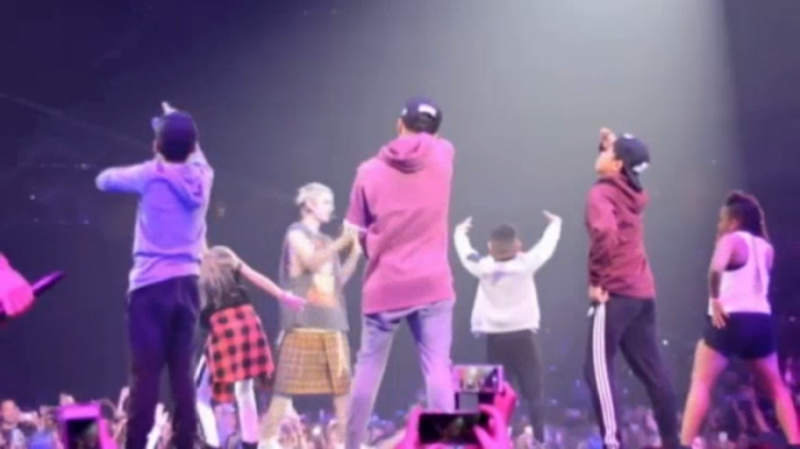 NBC: ‘We’re All on Cloud 9’: Bay Area’s Chapkis Dance Kids Shared the Stage With Justin Beiber Last Night! Six Bay Area kids from Suisun City’s Chapkis Dance shared the stage with Justin Bieber last night during his “Purpose” tour. Sarah “Lil’ Mini” Phoenix, Mark Cotton Jr, Jonathan LaForga, Zach Belandres, Cameron Belandres and Gabriella “Gabi” Crump were chosen out of thousands of applicants who submitted videos for a chance to dance alongside the pop star. Another dancer with Chapkis was also selected. Kida Burns performed with Bieber in Sacramento earlier this week. The contest was put on by Bieber’s choreographer Nick Demoura. He announced it on YouTube with a step by step tutorial of the choreography for Justin’s song “Children.” Instructions were to record yourself doing the choreography and stating your name, age and city you would like to perform at, plus a statement about why you want to perform with Justin. Demoura picked kids ages 9 to 15 in every city that the tour stops. Emails were sent out to the winners. “It was the most awesome amazing experience. I still can’t believe that just happened,” said 10-year old Phoenix. The kids though are no stranger to the limelight. Zach and Cameron were finalists on “America’s Got Talent” last season, and Phoenix performed on “So You Think You Can Dance” last September. The kids dance with a crew called “ChapKidz” and won first place at Hip Hop International last year. It was the first time a U.S. team has won that distinction. “It was an amazing experience for all of us. We are all on cloud 9,” Zach and Cameron’s mom Lornalyn Duran-Belandres said. As one parent put it: For the rest of our lives, hearing Justin’s songs, especially his song “Children” will forever take us back to this once in a lifetime experience. NBC Bay Area’s Jodi Hernandez’s sons dance with Chapkis Dance.